Duty, reflection and study are the gateway to opportunity, as such one honors those relationships to God, family, country and Masonry. The apron of the 4th degree is white and black, with a letter “Z” and all-seeing eye. 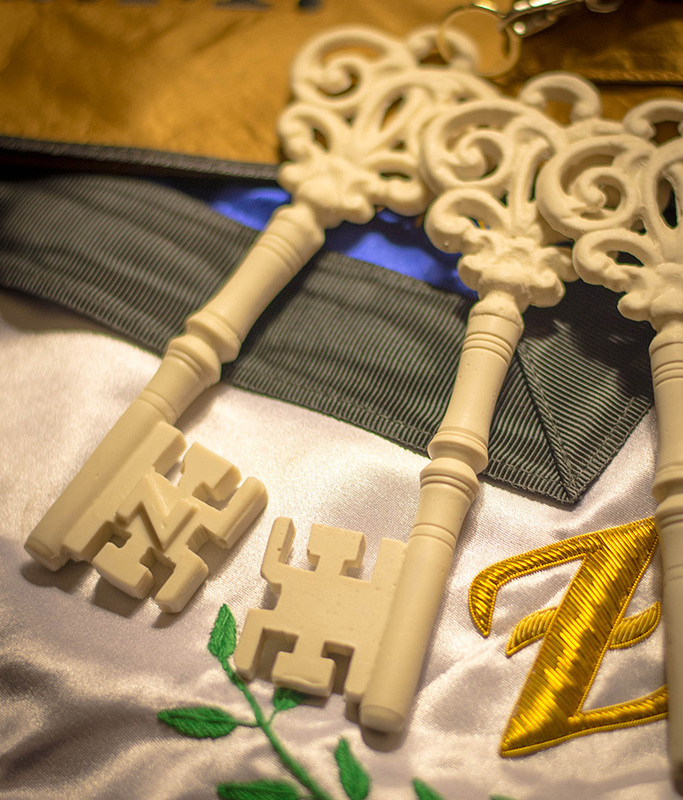 The jewel of this degree is an ivory key with the letter “Z” on the wards. The teachings: secrecy, obedience and fidelity. The degree teaches Masonic honor; that honesty and trustworthiness is the cornerstone of the foundation of such. This virtue should be in all of our undertakings with mankind. The apron of the 5th degree is white and green, with a cubic stone and a Hebrew YOD. The jewel is represented by a compass open on a segment of a circle, to an angle of sixty degrees. The teachings: honesty, sincerity, and good faith. In this degree one should expand their knowledge of duty, charity and toleration. We are instructed to reshape ourselves and our thinking into charity, self-control, and success i.e. to be a peacemaker. The apron of the 6th degree is white and red, with Hebrew letters YOD HEH in the center and a small triangle containing the Hebrew letters (clockwise from top) BETH, NUN, and SHIN. The gold triangle with the same three letters inscribed is the jewel that represents this degree. We should strive for perfection by using the great principles of “God’s inherent love, charity, morality and kindness”. The apron of the 8th degree is white, with red and green, with a balance, a nine-pointed star, and a triangle with the Hebrew letters BETH (for Ben-Khurim), YOU (for Jakinah), and ALEPH (for Achar). The jewel of this Degree is a gold triangle with the same three letters. 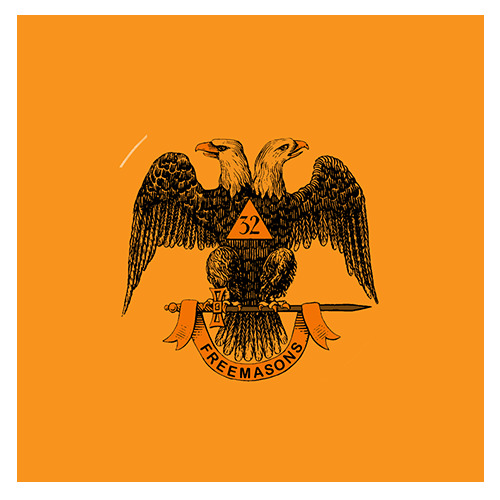 Truth, candor and generosity; the foundation of Scottish Rite Masonry is most reflected in this degree. We should use these truths to shape our lives and conduct. The apron of the 9th degree is white, lined with black, and sprinkled with blood, with an arm holding a dagger and a severed head held by the hair. The jewel of this degree is a dagger, hilt of gold and blade of silver. This degree teaches us to be tolerant and respect the opinions of others. Freedoms of political and spiritual ideologies should be shared by all. The apron of the 10th degree is white, with a black flap, and with three arch-shaped gates – over each a head on a spike. The jewel of this degree is a dagger as in the 9th degree. This degree teaches faith in morality and virtue and in God. “Life is what each man makes of it; the optimist turns a trial into a blessing. The apron of the 12th degree consists of a white outer shell, lined with blue and gold (symbolizing the Craft degrees), with a protractor, plain scale, sector, and compasses. The jewel is a heptagonal medal of gold. Liberty; in our mind and our hearts, motivated by duty and honor are the lessons of this degree. The apron worn is purple, bordered with white, and with the “Enochian delta” (hexagram with inscribed Tetragrammation) in the center. The jewel comprises a circular medal of gold. This degree teaches us to reflect and scrutinize oneself. We should strive to be true to ourselves and our God. The apron being of white silk, bordered in gold, with the Ineffable Delta in the Center is truly emblematical of the degree. The jewel of the 14th Degree is split; one being a quadrant (compass open to ninety degrees) topped by a crown and with a nine-pointed star on the obverse, the other being a five-pointed blazing star (with the Tetragrammaton) on the reverse. The compass is opened on a segment of a circle, inscribed with the numbers 3, 5, 7, 9. © 2017 Los Angeles Scottish Rite. All rights reserved.